Join restaurateur Carmel Ruggeri as she takes you through her part of the world, her island, Sicilia. 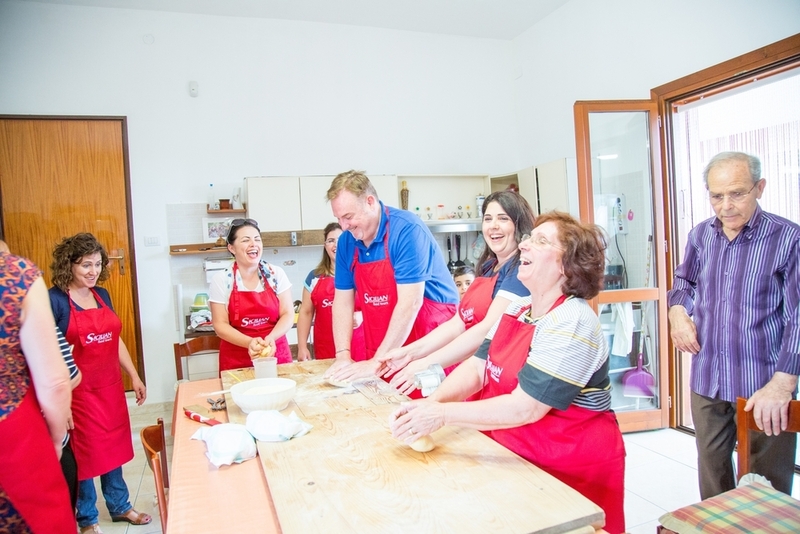 Join me on the magnificent island of Sicily and immerse yourself in our food and culture. Cannoli, juicy ripe tomatoes, Sicilian cheeses, giant eggplants, Sicilian salsiccia, pistachio salami, the best gelato in the world, local Sicilian wines, produce you will never ever forget. Come meet my family, they will open their homes and you will get to experience the true Sicilian warm hospitality. My beautiful cousin Gloria will be joining me as co-host on this tour. 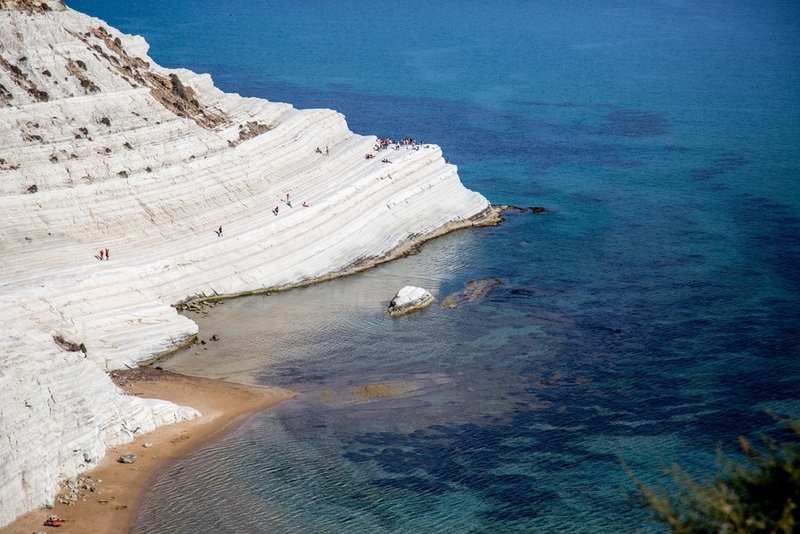 We look forward to sharing our beautiful Sicilia with you. We meet at Catania Airport at midday for a two hour bus trip to the undiscovered South coast of Sicily, to the small fishing village of Scoglitti overlooking the Mediterranean Sea. Here we settle into our beachfront hotel for lunch on the beach and sample the first of our many Sicilian delights prepared by cousin Carmel, yes a cooking class on the beach. Ricotta ravioli. Carmel will then take us on an informal afternoon walk around the town, our home for the next seven days. This includes a stopover at the fish markets & of course we stop for our first delicious gelato at Carmel’s cousin’s bar. We spend the morning discovering the beautiful Baroque Valley of Modica. Narrow lanes, alleys and staircases climb up the slopes on both sides of picturesque Corso Umberto. Always one of the favourites on our tours. We visit Antica Dolceria Bonajuto, the oldest chocolate factory in Sicily founded in 1880. The New York Times called it “...chocolate of astonishingly pure, powerful flavor.” Here we taste a variety of chocolate & one of the best ricotta cannoli in Sicily. This evening head to the cobblestone town of Ragusa Ibla. Ragusa Ibla hosts a wide array of Baroque architecture including palaces and churches. We take a walk through the beautiful communal villa. We enjoy a rustic dinner at one of Ibla’s finest restaurants & we try local homemade ravioli. This morning we head to the fish markets in Ortigia on the East coast of Sicily. We take a walk through the bustling markets & discover all the spices, fruits & veggies of Sicily. It’s July so the famous fico d’india (prickly pears) are in season and so are the cucuzza, Sicily’s famous giant zucchini - a must taste. We take a little boat ride around the magnificent island. A chance for a swim in the Ionian Sea. Ortigia is a small island which is the historical centre of the city of Syracuse. The island, also known as Città Vecchia, contains many historical landmarks including the spectacular Duomo di Siracusa. We wander through the narrow medieval lanes and head to lunch at one of Ortigia’s popular trattorias. We spend the afternoon at the UNESCO heritage town of Noto, one of Sicily’s most beautiful towns, flanked by grandeur baroque palazzi and churches. It’s like visiting a movie set. We visit the Valle dell’Acate winery run by the Jacono family where our host Giovanni Carbone takes us through the original 19th century palmento for a tasting of Frappato, Nero D’avola and Cerasuolo, Sicily’s only DOCG wine enjoyed with a light rustic Sicilian lunch. We get to taste the famous Ragusa scacce today. This evening we enjoy a traditional Sicilian Sunday feast at Carmel’s family home, where food and wine will be aplenty. We try the famous traditional Sicilian digestif Averna, which comes from nearby Caltanisetta. Before dinner, Zia Maria & cousin Carmel will demonstrate how we make fresh pasta, caponata & everyone’s favourite dessert sfingi (a type of Sicilian donut). Time to roll up your sleeves, join in and have some fun cooking. This evening we also enjoy a stroll, “the passeggiata” with the locals. This morning we make our way to the region of Agrigento. Today Carmel takes you to her favourite secret spot for lunch. Carmel’s dear friend Chef Leonardo will make Carmel’s favourite swordfish pasta for lunch. We will have Aperol Spritz on arrival and a spectacular view to top it all off. Late this afternoon we head to the Valley of the Temples to explore one of Sicily’s most famous historical attractions. This archaeological park consists of eight temples (and various other remains) built between about 510 BC and 430 BC: the Temple of Hera, the Temple of Concordia, the Temple of Heracles, the Temple of Olympian Zeus, the Temple of Castor and Pollux, the Temple of Hephaestos, the Temple of Demeter, and the Temple of Asclepius (the God of Medicine). All are situated in the same area on rocky crests south of modern day Agrigento - not really in a valley at all. We visit a tomato farm where tomatoes have been cultivated for decades. Fishing and the greenhouse tomato cultivation are the main source of income in this area. Ragusa is perfect for the tomato farms with its arrid, sandy, flat land. Today cousin Massimo will teach us how to make Pizza in his pizzeria at the nearby tiny town of Punta Secca & we get to taste the most amazing maccale’ in the world. A local favourite dessert. Tonight is our farewell dinner. Breakfast at hotel. Our Sicilian Food Tour concludes. Shuttle will depart at 9am for Catania airport from the Scoglitti hotel. Group numbers: Maximum of 15 guests. $4,300 AUD per person twin share, taxes included. No single supplement. Conditions apply. Style: Classic relaxed, fun and food. Basic fitness, lots of walking but mostly all on flat surface. 6 nights in standard beachfront hotel. Not fancy, however clean & in a super location. Private vehicle with a professional driver. 6 × breakfasts per person. 11 × main meals (lunch/dinner) per person. All activities specified in the itinerary, including entry fees and local guides where appropriate. Personal services of restaurateur Carmel Ruggeri, a bilingual Italo Australian & Gloria Catania. Both ladys’ families are from Scoglitti in Sicily. Gloria lives in New Jersey and teaches Italian. To book please email info@sicilianfoodtours.com or complete our online form.